Indiana "Carry" Bill creates interesting supporter and detractor headlines! Home Articles Indiana “Carry” Bill creates interesting supporter and detractor headlines! prevent local units of government (Counties, Cities and Towns) from passing restrictive firearms or ammunition laws that are more punitive than State Law. Discussions in the State Senate Committee on Corrections, Criminal, and Civil Matters and then after progressing out of Committee to full Senate for its three readings attracted little public or press attention. All of that changed when on Valentine’s Day the Indiana Senate passed Senate Bill 292 by a vote of 38 to 12 and sent the Bill to the Indiana House for consideration. Immediately after passage by the Indiana State Senate, SB 292 became the hot topic for news reporters and the subject of press editorials statewide. The news editorials were fairly evenly divided along predictable lines with those against – focusing on the right of local authority and those for – praising the fact that this bill would clarify the often confusing restrictions placed firearms owners in different locations around the State. As you would imagine, the lines both pro and con seemed clearly drawn as SB 292 moved to the House side of the Indiana General Assembly. But, the most surprising voice that emerged to challenge the Bill was that of Indianapolis Colts Owner Jim Irsay who was quoted in the Indianapolis Star listing a variety of fears. Irsay jumped to the conclusion that SB 292 would include events at Lucas Oil Stadium, Victory Field and other municipally owned sporting venues and convention centers. 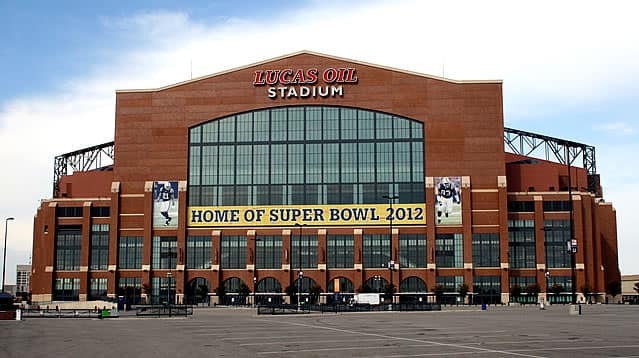 And, indicated that it might even jeopardize the 2012 Super Bowl scheduled in Indianapolis. Irsay even suggested that his fears included people like Herb Simon owner of the NBA Indiana Pacers, although no comment was been made by Mr. Simon. When Colts owner Jim Irsay expressed concern that the bill might result in fans legally carrying guns to NFL games in Indianapolis, State Senator Steele, R-Bedford, who had added his name as a co-author of SB 292, said the bill does not restrict private organizations staging events from barring weapons. This means that the Indianapolis Colts could bar guns, much the same way as the National Football League franchise bars carry-in alcohol. In response it was implied that the bill would be burdensome for the Capital Improvement Board, which provides security for the games. A problem those with gun permits face is local ordinances banning guns in specific locations. The ordinances vary widely between counties and cities, complicating where it is legal to carry. That inconsistency is not fair to gun owners who intend to follow the rules. Senate Bill 292 would maintain gun bans at schools and courthouses, as well as municipal buildings with a court. Other than these specific sites, SB 292 would lift local bans on carrying firearms in government facilities, including parks, libraries and municipal buildings without courts. Some might bemoan guns in parks or libraries. But Congress lifted the ban on carrying firearms in national parks years ago, and tourists haven’t yet turned the sites into scenes shown in movies on the Wild West. While the whole issue raised by Mr. Irsay was entertaining, if short on facts, the fate of SB 292 in the Indiana House remains under a cloud. On February 22, 2011 the Democrats walked out of the Statehouse to prevent a House Bill on “right to work” from being heard. In walking out, thus removing the majority votes needed to pass legislation to be forwarded to the State Senate. In so doing the Democrats stranded dozens of other Bills that had to be approved by the House by February 22nd thus let them die. This included the State Budget. Because of the importance of passing the two year State Budget, it will be interesting to see if SB 292 will get a chance to be heard on the House side before the Legislative session closes on March 14th. In the 2010 Indiana Legislative session the State of Indiana passed a law allowing licensed firearms owners to have firearms in locked storage in their vehicles and removed the right of individual places of employment, sub-divisions, or other groups to place restrictions on firearms owners. The 2010 legislation was quickly dubbed the “trunk law”, but restricted licensed carry in or on school property (including universities), controlled access areas of an airport, mental health facilities, and prisons. Most of the restricted areas were already covered as off limits under Indiana concealed weapons laws. However, discussion started in some communities about using local law to add additional restrictions. While there was never any major discussion about outlawing firearms as was done in Chicago, there were discussions about locally supporting firearms restricted areas as it applied to firearms locked in a vehicle or carried. Preemption of local firearm regulation. Prohibits, with certain exceptions, a political subdivision from regulating any matter pertaining to firearms, ammunition, and firearm accessories. Allows a person to file an action against a political subdivision if the person is adversely affected by an ordinance, measure, enactment, rule, or policy of the political subdivision that violates the law. involving the use of a firearm. In or On School Property. who are transporting a person to or from school or a school function. Van Phillips uses his long university teaching teaching experience as an NRA Pistol Instructor offering numerous yearly classes in Central Indiana for adults. He is also a 4H Pistol and Shotgun Instructor, CMP and SCTP Coach. Van is a competitive clay target shooter active in both ATA Trap and Sporting Clays. While he teaches pistol to adults so that through knowledge they can be better and safer firearms owners, his passion is empowering the youth who represent the future for continuation of 2nd Amendment and Concealed Carry rites!